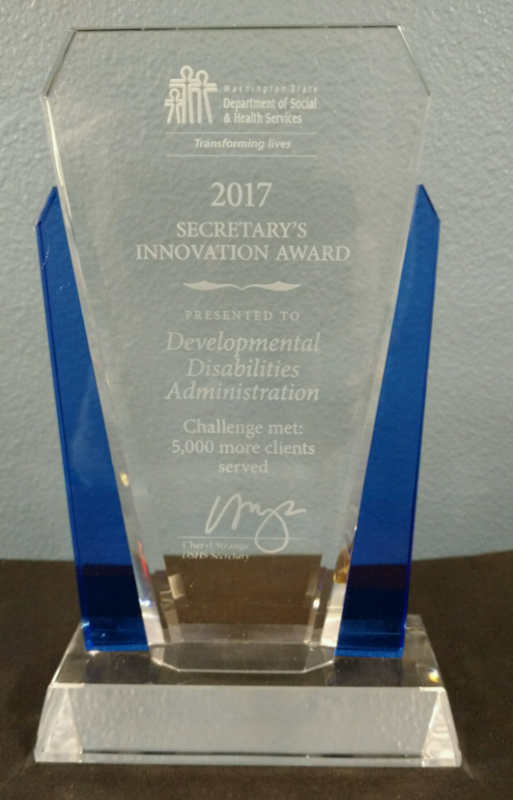 The Developmental Disabilities Administration recently received the 2017 DSHS Secretary’s Innovation Award for its extraordinary work to serve an additional 5000 individuals, the majority of whom were on the No Paid Services caseload. The effort began in 2014, when state lawmakers responded to pleas from DD advocates to provide funding for the thousands of individuals and families in need of services—a request that dates back close to 20 years when DD stakeholders began their first big rally for the unserved. Design a new Home and Community Based Services waiver (Individual & Family Services) in order to get matching federal funds, which allow more people to be served. Transition the individuals and families served under a state-only IFS program to the new waiver. Move 5,000 individuals from the No Paid Services Caseload into either the IFS or Basic Plus waiver. Implement this expansion while also partnering with HCS to implement the new Community First Choice (CFC) program. It was an enormous task that required extra effort at every level of DDA—from Central Office to the regions, where case managers and intake staff worked long hours to handle the increased demand. Throughout the years, we here at Informing Families have witnessed the hard work of DDA staff who rarely receive recognition or thanks, and so we offer our heartfelt congratulations to all those dedicated individuals working in the DD Administration.